"I absolutely loved visiting Ardis while she was at..."
"She was a special, classy lady. I am so glad she was part..."
"Ardis was a lifetime member of VFW Auxiliary 7824 and we..."
Ardis Hamilton Bradstreet was born in Portland, OR on October 30, 1928 to Clyde Clinton Hamilton and Mabel Alice Bean. She died on January 4, 2018 and was preceded in death by her husband Russel W. Bradstreet and siblings, Dolores and Clyde. Ardis and Russel were married 50 years and are survived by their five children, Roger, Russel, Robin, Rita and Rhonda, 14 grandchildren and 24 great grandchildren. 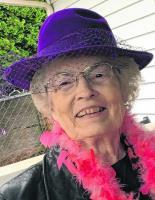 Ardis enjoyed crossword puzzles, visiting friends, volunteering, dancing and singing. She retired from the Evergreen School District and performed with the Sweet Adeline's Choir. She will be missed. A celebration of her life will be held at Evergreen Memorial Gardens Chapel at 12:30 p.m. on Tuesday January 9, 2018. Please sign her guestbook at www.columbian.com/obits.